The God, Religion and Politics conference will present a range of speakers talking on discourses relating to religion and the Bible in contemporary politics (broadly defined as post-1945), with a particular (but not exclusive) reference to British politics. What assumptions about, and constructions of, ‘religion’ and ‘the Bible’ are made in political discourse? To what extent do politicians engage with discourses relating to religion and the Bible? Do different political parties and political traditions have notably different discourses about religion and the Bible? How do discourses about religion and the Bible relate to discourses about, for instance, nationalism, gender, sexuality, ethnicity, and disability? How do pressure groups and think tanks relate to discourses about religion and politics? How are discourses about religion and politics represented in contemporary culture (e.g. literature, film, TV, social media, newspapers)? In what ways are historical understandings of political discourses tied in with historic understandings of the Bible and religion? Call for papers: If you wish to present a paper, please send an abstract of approximately 150-200 words to godreligionpolitics[at]gmail.com. The closing date for submissions is 2 March 2015. Papers will be around 25-30 mins long, with 10-15 mins for discussion. 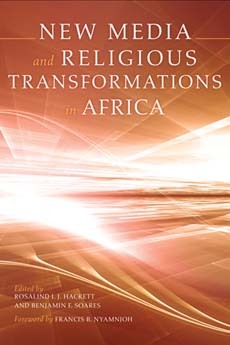 Rosalind I. J. Hacke tt and Benjamin F. Soares (Editors), New Media and Religious Transformations in Africa (Indiana University Press 2014).